After a sell-out season at Edinburgh Festival Fringe, The Generation of Z producer Charlie McDermott and actor-writer Ben Farry share their future vision of theatre with Dione Joseph. And it’s not just a post-apocalyptic one, where zombies run rampant, but rather a force field where money is creative energy. 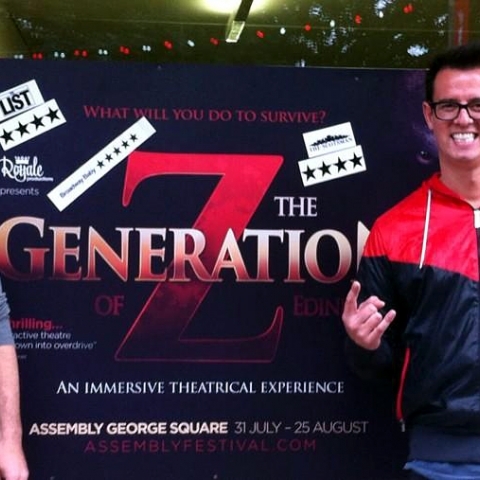 While it’s tempting to say that’s where a highly successful commercial show was born and became an overnight success, both McDermott and Farry are insistent that the real key to unlocking a genre of horror-based success has been the fact that Generation of Z is unabashedly a commercial entity orientated around the notion of money as ‘creative energy’. “We need to re-conceive our notion of artists and the associated importance of earning a living from our work so we can make the art that we want – uncompromised and unrestricted,” says McDermott. After sell out shows at Edinburgh to add to their blazing trail back home in New Zealand the future, however dystopian it might be, leers brightly for the Generation of Z.